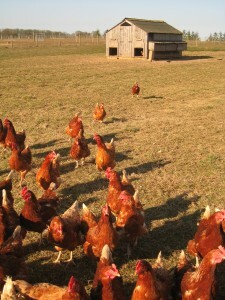 The eggs we sell are laid by our happy free range chickens. Unlike battery or barn kept hens, our girls are totally free range and have the freedom to roam around in their spacious fields. The chickens are only housed at night in purpose built wooden houses to keep them safe! Each house has approximately 60 chickens and at least half an acre of field to root, scratch and run around in. With the high quality feed available to the chickens they produce wonderfully tasty eggs! Our eggs are available to purchase Monday to Saturday each week throughout the year. During the fruit season they will also be on sale each Sunday. Each day’s eggs are generally made available from 9am, although this will be later in the Winter months, and can be purchased for £2.80 per dozen from the egg shed at the back of the farm. Please note that we cannot guarantee availability as our eggs tend to sell out quickly each morning.